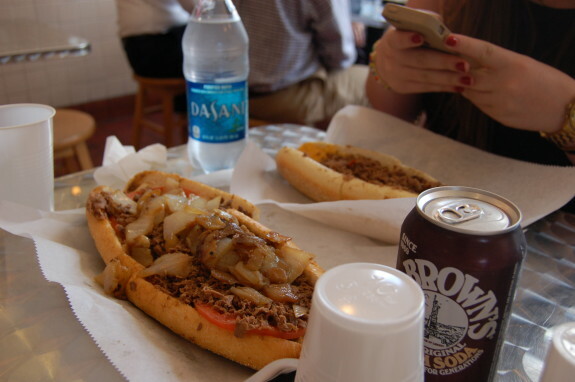 One of Philly's most well known foods is the Philly Cheesesteak. It goes like this. Beef is sliced thin and then grilled to perfection. It then goes on a nice soft bun kind of like a french roll then add your choice of Provolone cheese or Cheeze Wiz (affectionately known as "Wiz") and grilled onions if you desire (known as "with" or "without"). 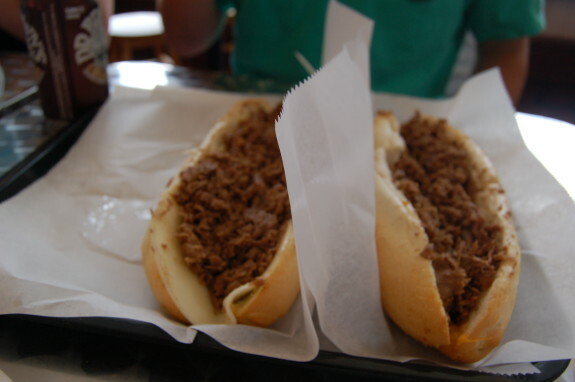 This was a must try on our list to get the true taste of Philly. 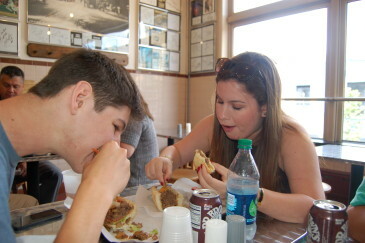 Now, if you do any research, you'll find out like we did that there are two very famous places for cheesesteaks that are literally across the street from each other and compete to see who folks think are the best-Pat's and Geno's. As far as we could tell it seems they are pretty evenly split. Our game plan was to get an identical sandwich from each and do a taste test. Joel, not wanting to have a sub par experience put his feelers out. His friend's dad had just been to Philly and strongly advised to avoid the "touristy" Pats's and Geno's and to head straight to Jim's steaks-the best cheesesteak he'd ever had. Who can argue with a suggestion like that? 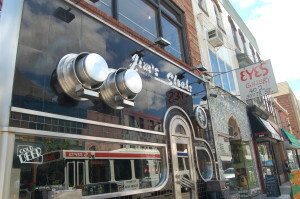 Off to Jim's we went. We could tell right away this was an establishment that move's a lot of meat. We were excited as we moved down the line and placed our order, watching them pile on the beef. We ordered one with Provolone and one with Wiz- only Isaac was game for onions. Our mouths watered as we were handed our trays and found a place to sit. The first thing that struck me as odd was when we lifted both sandwiches up, there was clear oil running out of both. Hmm, grease from the melted cheese maybe? Taking a bite we were all a little underwhelmed. The meat lacked flavor. The Wiz combo was by far the best as the salt (and G-d only knows what else is in that stuff) gave it a little punch. 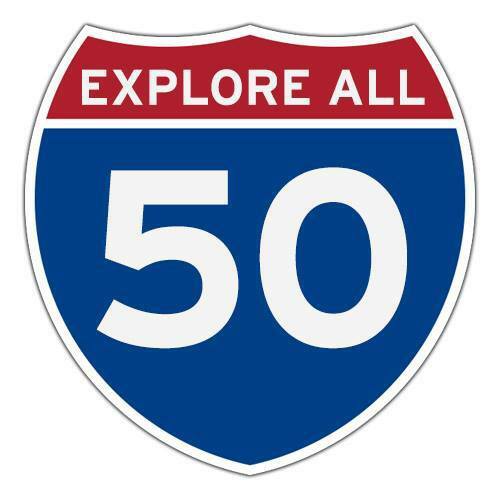 We all rated it about a 6 or 7, not bad, but not a repeat and felt a little disappointed as we left. Making our way across town to the Rocky steps everyone felt that awful cramp, you know the one that says, the freight train is coming full steam ahead-no stopping. We knew we had to find a toilet FAST. We parked in the museum parking lot ($32 btw) figuring we could use the toilet there and then check it out and validate our parking..Wrong...our luck the museum was closed that day. All the pleading about our situation fell on the security guard's deaf ears. Luckily a passerby came to the rescue and directed us to a rec center about a quarter mile away. We speed walked and made it without an accident by the grace of G-d. What a relief....lol. I suspect that the oil dripping off the sandwich lubed our insides. I know....EWWWWWW. Maybe the folks in Philly are just used to it? If you try the cheesesteak, wherever you try it, do so at your own risk and make sure you've got a bathroom nearby 30 minutes to an hour afterward. Just don't say you haven't been warned!! !